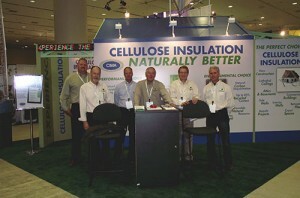 Thanks to all the attendees who visited the Cellulose Insulation Pavilion at Greenbuild 2012. Many of our Producer Members were at the Pavilion to help provide information and assist visitors with completing the short quiz to test their knowledge about cellulose insulation. Everyone who finished that quiz with all the correct answers was eligible to win a new iPad 3. One lwinner was drawn at random. Congratulations to Adam Ching of KYA Design Group in Honolulu, Hawaii! He’s our lucky winner and will be receiving a new iPad 3 courtesy of Cellulose Insulation. Greenbuild 2012 in San Francisco was a huge success with thousands of attendees and an Expo floor filled with great new innovative green building ideas. Look for more stories from Greenbuild 2012 coming soon here on the Greenest Insulation Blog. This entry was posted in Cellulose Insulation, News & Information, Sweepstakes & Prizes. Bookmark the permalink.